In Euclidean Geometry, the parallelogram is the simplest form of a quadrilateral having two sides parallel to each other. The opposite sides of a parallelogram are equal in length and angles are also the same. The congruent sides are the direct consequence and it can be proved quickly with the help of equivalent formulations. Rectangle – This is a parallelogram with four equal angles and the opposite sides are also equal. Rhombus – This is a parallelogram with four sides of equal length. Rhomboid – This is a parallelogram whose opposite sides are parallel and adjacent or equal but its angles are not right-angled. Square –This is a parallelogram with four equal sides and angles of the same size. The parallelogram is a geometrical figure that is formed by the pair of parallel sides having opposite sides of equal length and the opposite angles of equal measure. The height and base of the parallelogram should be perpendicular to each other. 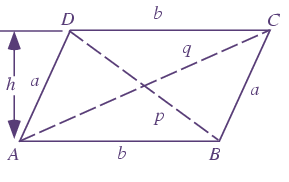 The area of a parallelogram is equal to the magnitude of cross-vector product for two adjacent sides. This is possible to create the area of a parallelogram by using any of its diagonals. The leaning rectangular box is a perfect example of the parallelogram. 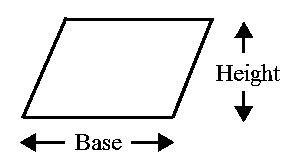 Where b is the length of any base and h is the corresponding altitude or height. A parallelogram is a four-sided polygon bounded by four infinite segments and it makes a closed figure that is referred as the quadrilateral. Or we can say that the parallelogram is a special case of quadrilateral where opposite angles are equal and perpendicular to each other. With the help of a basic list of parallelogram formulas, you can calculate the area and the perimeter by putting the values and derive the final output. In the next section, we will discuss on popular properties of the parallelogram for quick identification of shape. Two pairs of the opposite sides are equal in length and angles are of equal measure. The pair of opposite sides are equal and they are equal in length. The adjacent angles of the parallelogram are supplementary. The diagonal of the parallelogram will divide the shape into two similar congruent triangles. The shape has the rotational symmetry of the order two. Based on parallelogram law, the sum of the square of sides is equal to the sum of the square of the diagonals. The sum of the distances from any given point towards sides is equivalent to the location of the point. If there is a point A in the plane of the quadrilateral then based on the property, every single line will divide the quadrilateral into two equal shapes. Hence, a parallelogram could have all properties listed above if any of the statements become true then this is a parallelogram.